A long circular walk on to Buckden Pike from West Burton via a moorland crossing of Naughtberry Hill and returning via the length of Waldendale. 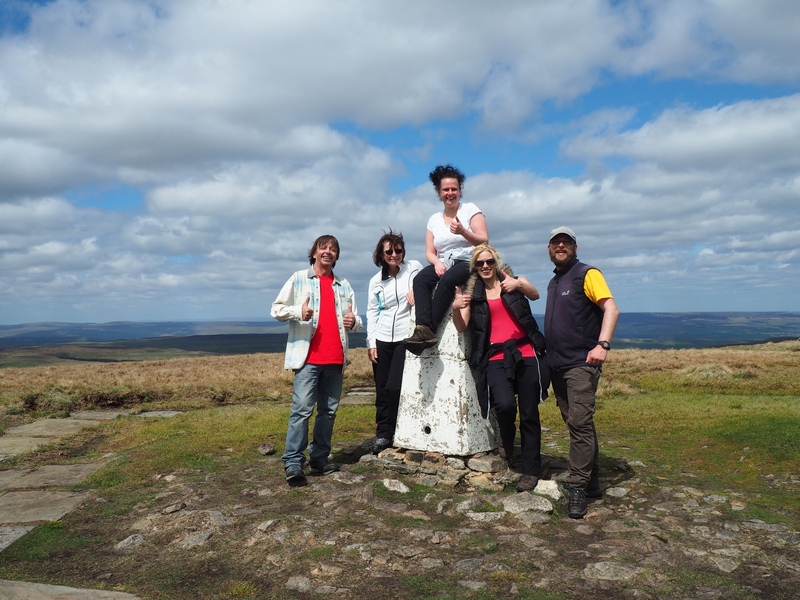 This was the seventh in a series of walks that I was leading for a group of friends I work with as we prepared for the Yorkshire Three Peaks Challenge walk that we are doing in July. After attempting to do a similar walk to this one a fortnight before, when we fell short of the summit of Buckden Pike due to bad weather, we were back in West Burton to give it another go. This time, rather than walking up Waldendale first, we instead left West Burton to cross a few pastures and drop down into the small village of Newbiggin in Bishopdale. Whilst passing through the village we made a short detour up Mill Beck to visit a lovely little waterfall, unmarked on the map, that I’d first come across way back in 2008. After passing through Newbiggin we climbed some rougher pastures to join a lovely fine grassy path up through Floutgate Scar. With a wide prospect of Bishopdale the views from Floutgate Scar were one of the highlights of the walk. Above the scar there was a noticeable change from limestone to heathery moorland. A thin path took us across the moor to the cairn and ruin on Wasset Fell. A rougher spell of walking, some of it following a broken down wall finally brought us to the unmarked summit of Naughtberry Hill. From the top of Naughtberry Hill we continued south-west on the broad heathery ridge on a line that alternated between a thin path and a strip of bog. Considering that just two weeks before it had been so wet it was remarkable how dry it was underfoot. While my friends may not have agreed with me it was certainly easier going than I expected. Eventually we came to a fence, then a wall which we continued to follow all the way up to the summit of Buckden Pike. A lone walker at the summit was the first person we’d seen since we’d left Newbiggin. He soon moved off, so having the summit to ourselves we sat down by the cairn and stake to eat our lunch. After lunch we walked south to visit the Polish airmen memorial. Just before reaching it we spotted a couple of dunlins. Unlike most moorland birds they seemed quite unconcerned at how close we were and for once I had time to change lenses on my camera to get a close up shot. Soon after visiting the memorial we arrived at the Walden – Starbotton path. Turning left on this we began a long and initially gradual descent over Walden Moor, passing early on the shallow remains of Hard Rake Quarries. A bit further on we reached the point that we’d turned back at on our attempt to climb Buckden Pike two weeks before. Continuing down over Walden Moor we came across someone who was out on a 25 mile walk as part of his training to do a 100 mile charity walk in Dorset. Despite the miserable weather a forthnight before I’d liked what I’d seen of Walden Head. Walking back through it in nicer conditions only confirmed this favourable impression. For the sake of variety we didn’t fully retrace our steps from the previous walk and instead took the footpath on the east side of the valley up to the farms at Ashes and Nell Bank. From the latter we joined Whiterow Road for a nice simple walk back to West Burton with more good views of the valley. This was a wonderful day out and considering this was also the longest walk any of my friends had done they all did remarkably well, especially considering several miles was across pathless moorland.